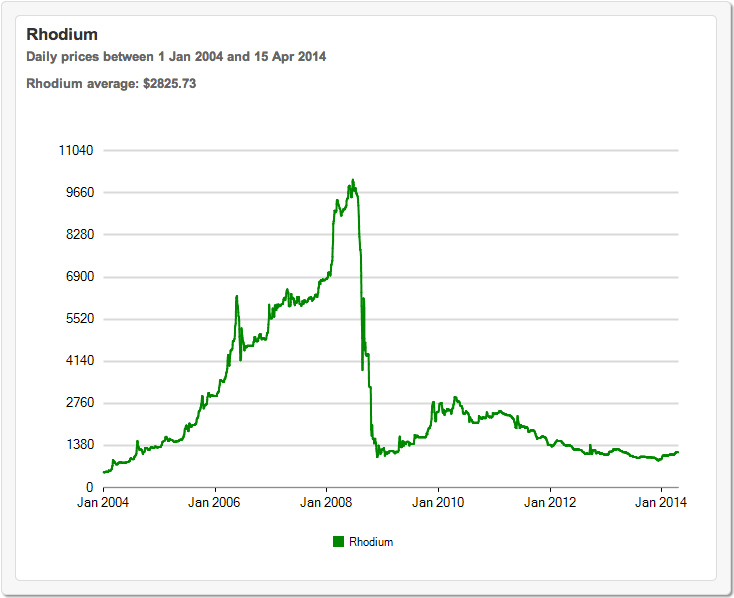 Only a few years ago, rhodium was easily the world’s most expensive metal with the per ounce price topping $10,000 dollars in 2008. It is 100 times more rare than gold, and over 150 times more rare than silver. But regardless of its exorbitant price, rhodium is an important metal for the automobile industry as its use in catalytic convertors is unmatched. Rhodium belongs to the group of elements commonly referred to as the platinum group elements (PGE’s) or the platinum group metals (PGM’s). The other elements that belong to this group are platinum, palladium, iridium, osmium and ruthenium. All of the elements that belong to this group exhibit similar chemical and physical properties. However, of all the PGM’s, rhodium is the rarest. Rhodium has many uses in the jewelry industry, as well as x-ray equipment, electrical connections, and electroplating. But rhodium’s main application is in catalytic convertors for automobiles. In fact, 80%-90% of annual production goes towards making catalytic convertors which convert harmful exhaust fumes into less polluting and less harmful substances. 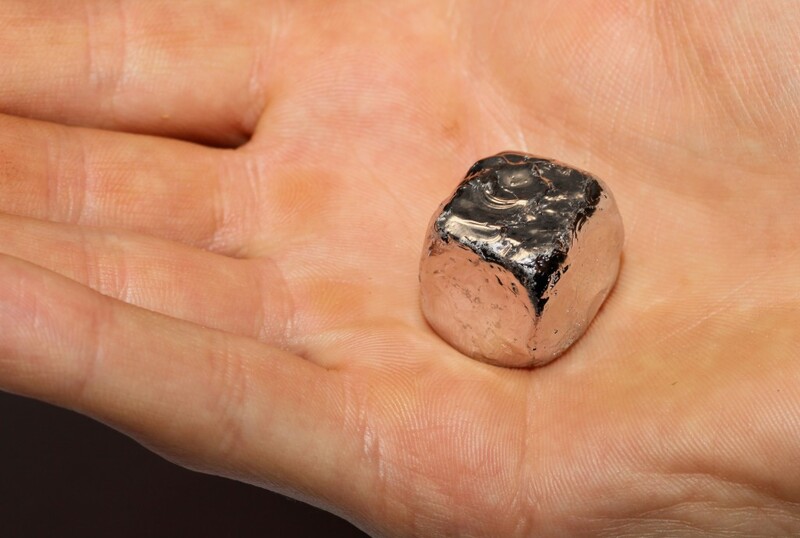 Because rhodium is so rare in the earth’s crust, there are currently no mines in the world that solely extract rhodium from the ground. All of the rhodium that is currently mined is a byproduct of mining other metals, mainly platinum. Platinum and nickel ores are mined and the rhodium is extracted as a white inert metal. Since the output of rhodium is completely dependent on the production of other metal ores, the supply of rhodium cannot be increased or decreased to respond to global industrial demand. This causes sharp swings in the price when demand shifts from one spectrum to the other. Of all the mines in the world, there are less than 10 that produce a significant amount of rhodium and they are mostly located in South Africa. The South African mines are responsible for over 80% of the global production of rhodium. This also contributes to the volatility in the price because any geopolitical circumstance in the South African region can grind almost all of the world’s rhodium production to a halt. For example, the Association of Mineworkers and Construction Union in South Africa went on strike in January of this year demanding higher pay. This caused a steep drop in Platinum prices and the situation is still an unresolved issue. 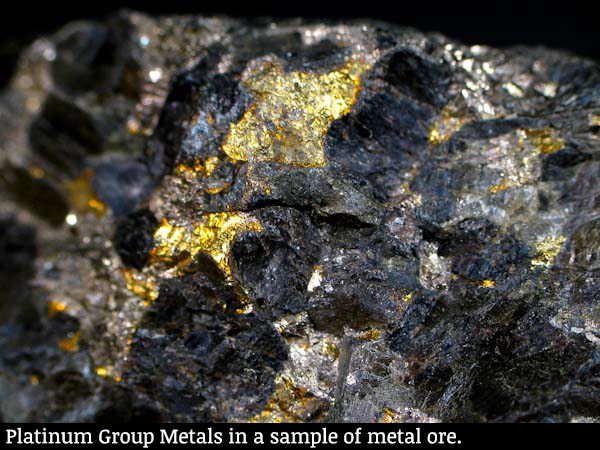 Adding to the volatility is the metal’s rareness, which is estimated in the earth’s crust at 0.0002 parts per million. Consider that in 2009, there was 2,350 tons of gold mined globally. Rhodium on the other hand sees an annual yield of roughly 25 tons. Unlike other precious metals such as gold and silver, rhodium spot prices are set twice daily for the American market by the Johnson Matthey Corporation. 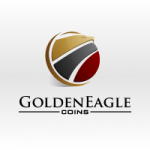 This allows for a more stable buying platform for people looking to invest in rhodium. 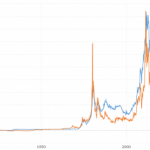 But with such a limited supply, and no way to increase it, rhodium doesn’t come cheap. When the economy was flying high prior to 2008, the automobile industry was at its peak and catalytic convertors were in high demand, with rhodium touching $10,000. Immediately after the global financial crisis and the decimation of the automobile industry (many car manufacturers had to be bailed out), rhodium fell more than 90% to a low of $760 dollars per ounce. It has been a slow grind, but since then the automobile industry has stabilized, demand has increased and rhodium has found solid footing. In 2009, the Cohen Mint was the first to produce .999 fine investment grade rhodium in the form of rhodium bullion rounds and bars. Since rhodium is extremely hard and has such a high melting point, it is extremely difficult to work with and special minting techniques were introduced to handle the metal. In 2011 an exchange traded fund was launched by Deutsche Bank that was 100% backed by physical rhodium and was designed to track the U.S. dollar spot price. 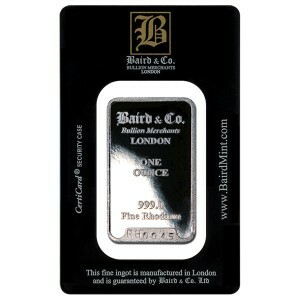 More recently, the most popular rhodium bar on the market has been produced by the Baird Mint out of the United Kingdom. Their lower premiums, sleek packaging, as well as the availability of fractional rhodium bars (1/10th ounce, 1/4 ounce, 1/2 ounces and 5 ounces) has made them the front runner when it comes to rhodium investing and rhodium bars. « Why Do Silver Coins Tarnish?